Professorship money enables undergraduate students to conduct senior research | An endowed professorship is opening doors for two Penn State students to obtain laboratory experience as undergraduates. An endowed professorship is opening doors for two Penn State students to obtain laboratory experience as undergraduates. These materials science and engineering majors, Atraphol Sae-Tang and Evan McHale, are conducting research for their senior theses in the Millennium Science Complex with Susan Trolier-McKinstry, Steward S. Flaschen Professor of Materials Science and Engineering. Their respective research may be just the beginning of larger, innovative projects at Penn State. Sae-Tang’s thesis involves the chemical solution deposition of materials used to produce piezoelectric materials, which are used to convert electrical and mechanical energies within widely used electronic devices, such as humidifiers, smartphones and airbag sensors. 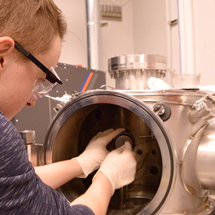 McHale’s thesis focuses on lowering the crystallization temperature of a bismuth zinc niobate, a material used as an energy storage capacitor. The capacitors accumulate large amounts of energy, which make them candidates for devices that require high levels of power to operate, such as industrial lasers, heart defibrillators and hybrid vehicles. Both students expressed their gratitude for the opportunity to conduct research in a lab setting.